A limited time only, get 2 shirts for 400€ instead of 500€. - Please type your preferred color for the second shirt into additional notes that will pop up when you click “preorder now”. 2x One size (M/L), crop top style t-shirts with a hand painted piece of canvas sewed on. Each piece is made to order. You preorder your shirts and I set out to paint and sew them for you (yes, I sew the whole shirt each time myself, too). 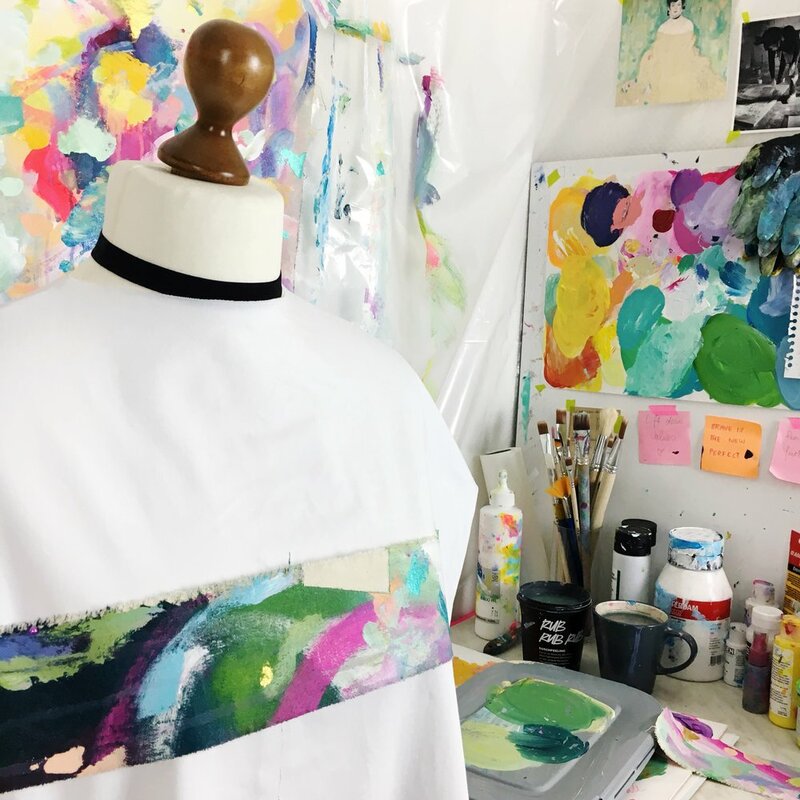 The shape, style and extent of distress will differ each time from the canvas parts I use to the techniques I utilize to make each shirt an individual piece of art. You can choose between dark or light shirt colors. Washing instructions: wash inside out in a washing net, max. 40° celsius. Don’t put in a dryer. If you are wondering how to take care of it, part of the concept is that you will see how much a piece is loved with time. There will appear creases and maybe some flakes will get loose, the canvas edge will fringe more… art is to be enjoyed, not closed off and guarded. Since this is an item that is made to order, please give me 1-2 weeks to paint, sew and ship your order, based on how many preorders I already have lined up. You can contact me if you have any questions at magic@juliabadow.com. Want to know more about this? I made a little video for you explaining the concept while you can follow my process of creating a shirt. You can find the FAQ's below! 1. What is the deadline to preorder this exclusive VIP offer? The deadline to preorder the VIP offer (I only made available to my most precious collectors) is Friday, July. 13th, at midnight EST, so be sure to pre-order now!! 2. Do I have to be a certain size, gender or age to wear "MACH BUNT"? No! The shirts are constructed to be one-size, androgynous, avant-garde and rather baggy. I chose to add the size code M/L even though I consider it one-size, just because I've been plus size for so long and always laughed at the mention of one-size fits all. The M/L indicates a man's shirt width in that size. So if this would fit snug on you, my shirts will fit snug on you. If it would fit loose, my shirts will fit loose. As for gender norms... I don't adhere to those and hope that if you like the shirt, you'll wear it with confidence, no matter what your favorite pronouns are. The same goes for age. Wear what makes you happy and it will transform your whole posture, confidence, and outlook on life. 3. Is there a guarantee, in case I feel it’s not right for me? There is a no-questions-asked 14-day money back guarantee from the moment you received your package if you find it is not right for you. Learn more about returns here. 4. I am not sure this is the right thing for me, even though I like the look of "MACH BUNT". This wearable art line is designed for new collectors and art enthusiasts who have never bought a piece of art before. My goal is to help you get comfortable with owning a piece of art that will enable you to choose with confidence in the future. It is also a novelty concept to "wear" art and is meant to make art more accessible in general as well as show proudly to the world which artist you support. My goal is to take you by the hand and make sure you have exactly what you need to bloom from art enthusiast to collector regardless of where you are in your life and have fun while doing so. Also, as a special thank you for supporting me and my art I will feature you on my Instagram page wearing my shirt. So get your camera ready and take a selfie with your new wearable art. Send it to me at magic@juliabadow.com for a feature on my Instagram! 5. How are the shirts made? I sew every single shirt myself. I design the shape, draft the pattern, cut it, sew it, paint the canvas pieces and attach them individually. Each T-Shirt is an utterly unique wearable piece of art made completely by me from start to finish. I also sign each piece, like I would my other paintings. Have a look at the video above to watch my process. 6. How do I take care of my wearable art piece? Part of the concept is that you will see how much a piece is loved with time. There will appear creases and maybe some flakes will get loose, the canvas edge will fringe more… art is to be enjoyed, not closed off and guarded. max. 40° Celsius. Don’t put it in a dryer. 7. What does preorder exactly mean? The moment you hit preorder on my website, the shirt is added to your basket. From there you can go to the checkout, enter your details and effectively buy the next shirt I'm going to make. You pre-order your shirt and I set out to paint and sew it for you. The shape, style, and extent of distress will differ each time from the canvas parts I use to the techniques I utilize to make each shirt an individual piece of art. 8. How long does it take to ship? Since this is an item that is made to order, please give me 1-2 weeks to sew and ship your order, based on how many preorders I already have lined up. 9. What does "MACH BUNT" stand for? It's German and a play on words. In Germany, we say "blau machen" (literally "make blue") to say we have a day off or just intend to do nothing in an enjoyable manner. "Bunt" is our word for "colorful". So together it means "Make your world more colorful in a chilled kind of way." which basically is my whole philosophy on life right now. After launching my last series "Love Yourself" I wanted a passion project that was fun and exciting for me to do. "Love Yourself" was a deep dive into my emotions, fears, doubts and generally brought up some heavy stuff. "MACH BUNT" is the counter movement to this. Something fun, summery, perfect to play with and not emotionally demanding in any way. It still carries a message, though. 10. What are others saying about "MACH BUNT" and Julia Badow's art? "Julia's art is a burst of pleasure and delight. The colors dance across the canvas as if revealing a map to a magical land where your soul is free to fly where it desires." 15% of all profits from "MACH BUNT" will go to Clean Clothes Campaign, an organization dedicated to improving working conditions and supporting the empowerment of workers in the global garment and sportswear industries. Let's work together to improve the conditions for those who make the clothes we wear. So if you’re ready to make a HUGE difference in your life, in the life of those you serve and in the lives of the workers that sew your clothes, plus get an extra mini piece of painted canvas FREE, then preorder your own piece of wearable art now! 12. Is there anything else I should know about this offer? The whole idea has been floating in my head for a while now and came into its final shape while watching Tokyo street style videos on youtube one night (I adore how completely undaunted and unapologetic fashion is in Harajuku). I wanted something for you Gorgeous, that made you feel special, closer to me and my art and overall feel part of my tribe of color lovers and art enthusiasts. My goal is for you to feel confident and happy whenever you see one of my artworks, be it on your wall or your body. Everyone following my journey has been supportive and encouraging, and I wanted a way to connect to you and say thank you. It does help that I have a background in fashion design and will always harbor love for both fashion and art! This offer is especially effective for collectors outside of Germany (low shipping costs) who have NEVER bought art from me before (out of fear it might not suit their homes) or are too unsatisfied with their current space to even think about buying art for their walls, but still, want to own my art... So if that is you then you’ll want to hit preorder right away.